Words: Zac Kurylyk. Pics: Laura Deschenes, unless otherwise specified. Back in the day we used to get a complete set of motorcycle gear for Messers ‘Arris and Seck to abuse over the season and then report on how well they lasted (or did not) once winter blew its frosty breathe over the riding party. For some reason that idea fell off the radar but with our new News Editor, Zac Kurylyk, on board and hungry for some riding gear other than work boots and garbage bags, we thought the poor guy needed a new wardrobe. He might even do us proud and crash test it all for us, like he did last year on ‘Arris’ Konker. Who doesn’t love a leather motorcycle suit? Once they’re broken in, nothing feels more comfortable, and as round-the-world adventure rider Austin Vince says, if your motorcycle travels take you to a disco, a pair of leather pants instantly makes you the coolest person in the house. Waterproof leather? That’s what Aerostich reckon. But, leather has one problem. Once you peel the skin off a dead cow, process it into leather, then stitch it into a jacket and pants, it tends to lose its waterproof qualities. Nobody enjoys having to lug around an extra rain suit on the bike, but if you want to stay dry in your leathers, you don’t really have a lot of choice. Unless, of course, you have an Aerostich Transit suit. 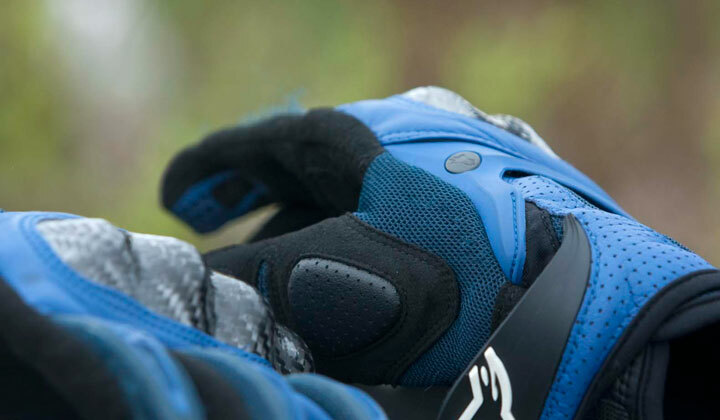 While Aerostich is best known for their long history of producing textile riding wear in all manner of colours, they’ve also taken a look at other, more traditional fabrics in recent years, including leather. 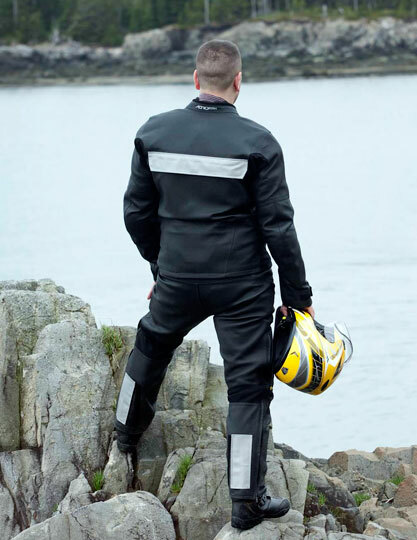 While gear snobs may turn up their noses at the antiquated idea of a leather riding outfit, the Transit suit should force them to take another look — sure, it’s got classic styling and cut, it’s leather — but it’s also waterproof. At least, Aerostich claims that it is, along with a few happy Internet reviewers. But who’s to really say? Well CMG, that’s who! We’ve got our grubby hands on one of the Transit suits, and we’re going to see if it really is up to all-weather commuting here in the Great White North. The suit is a radical departure from Aerostich’s usual offerings — after all, the company has made their name with a lineup of textile suits — and for an asking price of $1,594 US it’s not cheap either! But you get a waterproof leather suit, that fits perfectly … if you took your measurements right. 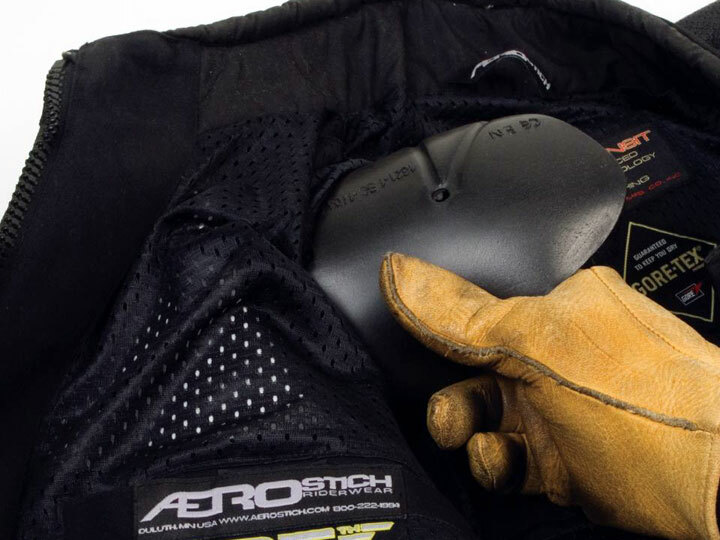 Since Aerostich is a mail-order operation, you can’t try the suit on before you buy it – so measure twice, ship once. I even went to a tux rental outfit to get measured for my suit, just to be sure. Unlike textile suits, leather stretches to fit you more comfortably over time, so Aerostich president Andy Goldfine asked us to give the suit an extra-long evaluation period, to ensure the suit has time to break in properly – it’s pretty stiff when you try it on for the first time (taking a cue from Genesis, it seems the suit wants to make the wearer in its own image). Once you get the gear on, though, all armour and padding sits comfortably. But with Goldfine’s instructions in mind, we’re likely skipping the usual end-of-year review, and instead we’ll take a closer look at how it fared next year after a couple of seasons of use. First off: Waterproof leather? What’s up with that? 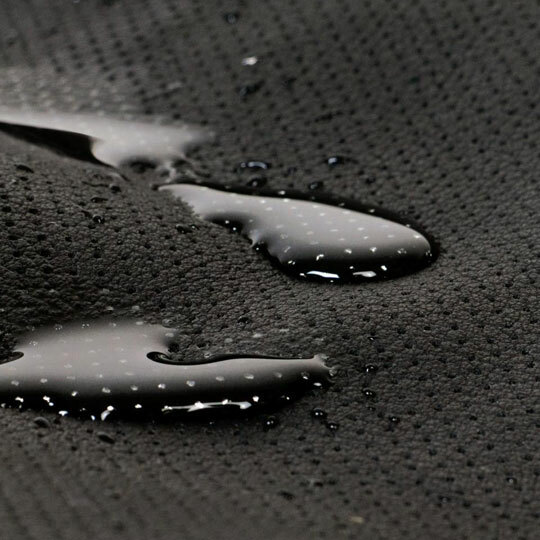 Well, the suit is made from something Aerostich calls Pro Shell Leather – it’s basically Gore-Tex and leather combined for a material that keeps you dry. And, in the first few weeks of testing, it seems to work. The zippers are waterproof too, and airflow vents are also minimal (the suit’s designers want to keep water out after all). That also means the sleeve cuffs are very tight, to prevent water from seeping in. Unfortunately, that also prevents the user from wearing bulky clothing to fend the cold off too. If you’re just wearing a sweatshirt, you’re fine, but if you start layering multiple sweaters and hoodies, it’s going to be a tight fit. Solution? Buy an electric vest. 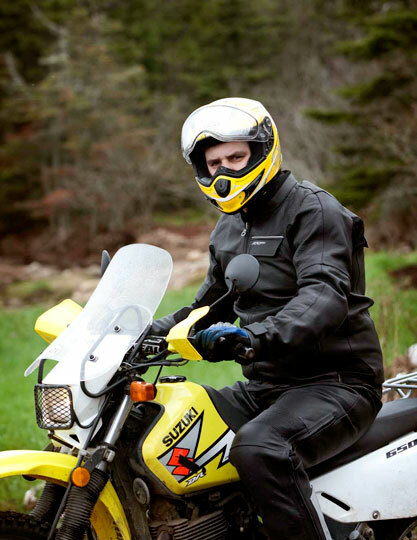 If you’ve got $1,500 to spend on the suit, you can surely spring for the plug-in warmth and it will extend your riding season too? We’ll see how that idea works out in the fall though. And what about armour? The Transit suit uses replaceable TF5 armour in the elbows, shoulders, knees, hip and back, though it’s not CE-approved. No problem, claims Aerostich – as they think their stuff is better. That’s the sort of thing that’s hard to tell without crashing, though, and we’re not about to go lowside for the sake of this article. Specifications aside, the armour in the jacket does seem to be a little awkward to put on, at times; hang your jacket at a funny angle and you’ll find you have to adjust the pads before you can slip the jacket on properly. The Transit encompasses Aerostich’s reflective strips. The jacket and pants have a zipper in the back to keep them together in a crash. It’s also handy if you ride in a formation and wish to shield the riders behind you from having to view your unsightly plumber’s crack, mile after mile. The jacket comes in sizes 38–52, with short, regular, and long sizes, and pants come in waist size 30–44, also in short, regular and long. Talk to Aerostich staff about size before ordering; if you plan to ride commando, they may recommend a smaller size than if you prefer to ride with pants on underneath the leather trousers (as I do). So, don’t expect an update on this suit anytime soon, but one is coming. I’m anxious for summer to get here so I can see how well-suited the Transit is for touring (and I’m also curious if the leather’s pigment will actually reflect sun and stay relatively cool, as claimed). 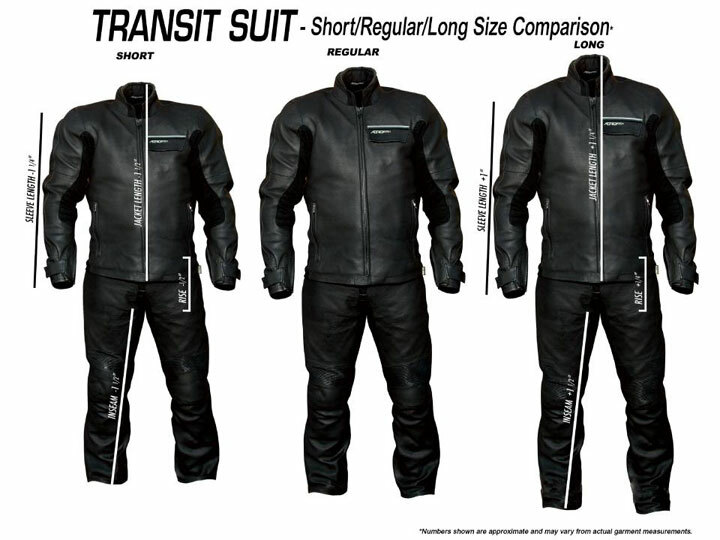 You can find out more about the Transit suit here. Our final test results are here. The brunch of boots – not quite off-road, not quite on. 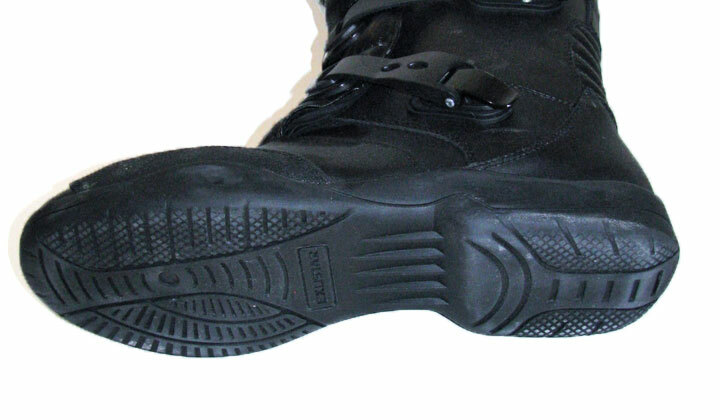 We originally reported on these Exustar boots back in March. At that point, we’d never heard of this brand anywhere else, but apparently they made bicycling shoes for years before deciding to branch into moto-footwear. Regardless of their pedigree, the Dempster dual-sport model that Full Bore Marketing shipped us seems pretty decent. I asked for a pair in my normal size 11 and the fit is perfect – I couldn’t ask for better. I actually think these boots are the most comfortable footwear I own at the moment. I haven’t had much opportunity to ride with them so far, but in my limited usage, I’ve been impressed. The boots seem to hold up to their waterproof claims so far, and are quite comfortable to walk around in once off the bike. My wife isn’t a fan of the styling — she says they make me look like Napoleon Dynamite — but once you get a set of dual-sport boots covered in grime, nobody’s likely to cast too many aspersions to your manliness. Soles are more road orientated. 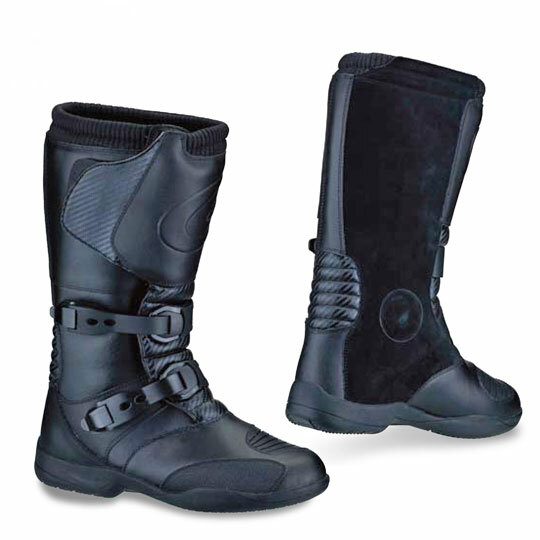 The boots have two buckles combined with a hook-and-loop closure system that works very well so far. They don’t have a terribly aggressive sole, if you want knobbies on your feet, not just your tires, look elsewhere. The upper is synthetic micro-fiber leather and the lining is an EWT membrane (not Gore-Tex) but it does exceed CE approval. According to the Full Bore Marketing catalogue, list price for these boots is C$249.99. We’ll have another look at these boots at the end of this summer, to let you know how well they’ve held up. And now over to Zac. Since Editor ‘Arris was unable to wear these Alpinestar Thunder gloves comfortably (too small for his ape-like hands), I’ve taken them over for the year. I don’t have much to say about them yet, but I’ve been wearing them on cold, early-spring rides, and have enjoyed using them even in those cold temperatures. I’ll update on these on the end of the summer as well. Seeing we’re talking aerostich here, how about a look at their new lightweight roadcrafters?